There are social media optimization strategies that you can implement to help your business get found when people search for your product or services online. One of these strategies is to ensure that your social media profile is optimized. Create unique social media profiles. That means that if you are in 5 social media sites, you need to create five unique social media profiles. Consider each social media profile as a block. Each block helps to define your brand, and each is part of your brand’s protective wall. Remember: avoid the urge to use a boilerplate. Keep all your social media profiles current. Do not just create it then forget it. Regularly go back to each profile and update it. Schedule it so you don’t get overwhelmed. When was the last time you checked your social media profiles? Complete your profile. LinkedIn has 48.1% incomplete profiles according to a survey. Have you seen incomplete profiles on other social media platforms? I am sure you have come across some. There are many of those that may be already asking you to follow them. 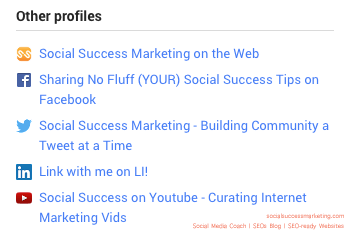 A list of social media profiles on GooglePlus that are optimized. Include links to your other social media profiles. Include as many links as the social media platform would allow; and whenever possible use keywords for your business. What I mean by that is this: instead of just entering your Facebook link and leaving it like that, describe it. Tell us what it is. How do YOU optimize your social media profile? Your turn!